It's the eve of Field Day. 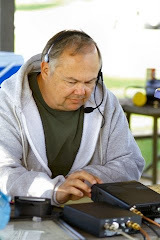 Saturday and Sunday many, many ham radio operators will switch their radios to battery power or haul entire stations into the field. There they will operate for up to 24 hours trying to rack up as many points as possible in the ARRL's annual non-contest. Do you participate in Field Day? How? Some people operate from home. Others participate with a group. Some are serious about racking up points, others use Field Day as more of a party with friends. My plans are to participate in two Field Day events. Our local club, Sangamon Valley Radio Club tends towards low key operating and a big Saturday evening cookout with all the families, etc. The local ARES group, Capitol Area Amateur Radio Emergency Response Team has a smaller more serious effort. Both groups seem to have a lot of fun. It's going to be very hot here in central Illinois. Whatever you do, if it's outside drink lots of water, have fun, and stay safe. We read a lot about the big mega-Hamfests -- Dayton, HamCom, Pacificon, SeaPac, Huntsville, etc. Many of us travel to one or more of them a year in search of bargains, to renew old friendships or perhaps meet an "on air" friend in person for the first time. They are great! Don't forget to attend and support your local hamfests though. They are treasures in their own right. Today my wife and I went to Egyptian Fest in Granite City, Illinois. 2009 marked their eightieth (that's 80 not 18!) year. I remember going to the Egyptian Radio Club hamfest back in the 70's when I was first licensed. I'd rummage through old equipment having no idea what a lot of it was. Even though I wasn't buying the old grey beards would explain the equipment to me and perhaps share a story about people I hadn't met and how they had used this or that to first get on the air or make a rare contact. It was an enjoyable day I looked forward to each year. Egyptian Fest is still a small, friendly hamfest. Today for their 80th birthday they pulled out all the stops with not one but two guest speakers plus a presentation on D-Star that I was unable to attend due to talking with too many friends while I should have been listening! First up was Bob Heil K9EID of Heil Sound. Bob showed a presentation that described a little background on the company and then did an interesting presentation on microphones, articulation, and what you want to be heard effectively on the air. Second up was retired FCC Special Counsel Riley Holingsworth K4ZDH. Riley talked about human nature in general and hams in particular. Along the way he shared a few humorous stories and then took questions. Not every small hamfest will have speakers like Bob and Riley. But an awful lot of them have some pretty sharp people talking about some aspect of the hobby they love. If you don't go take advantage of them you're the one who's missing out. The local hamfests are a good place for second chances too. Remember that vintage equipment I mentioned earlier? I'm pretty sure I saw a few of those same radios in the outdoor swap area today!